Dave Repol was only 15 when he bought his first car, a 1932 Chevrolet coach. But it certainly wasn’t unexpected: at age nine he got a local auto parts supplier to sponsor a soapbox racer that he built with his father. He then got involved in building models, to the point that his father even built him a special little room where he could work on them. He was, as they say, a natural when it came to automobiles. “It was the thing back then to make models,” he says. “I had one that won at Speedsport in 1962 and it went to Washington for the world championships. I still have the model. It was a 1940 AMT Ford with the doors and trunk all cut open and customized.” In 1976, he made the local paper when he spent 100 hours on a 2,378-piece model of a 1935 Mercedes-Benz that even required him to make each wheel out of 105 tiny parts. That first 1932 Chevrolet cost him $125 in 1962 – along with $3.75 tax, according to the bill which he still has - and he later sold it for $300. A neighbour, who got him his first job working at a hardware and wallpaper store in Toronto, helped tow it home with a truck. Dave rebuilt it, including the paint and upholstery, and drove it to school. He and his father worked on a number of cars together. “I used to have many cars in the back yard at one time and Dad never really said too much, I guess, because he knew where I was,” Dave says. In 1964, he not only had the ’35 Chev, but a 1929 roadster pickup, 1932 Oldsmobile and 1949 Mercury … and an ill-fated VW Beetle. Driving to a friend’s cottage in the rain, he touched the road shoulder, the rear wheels tucked up, and Dave woke up in Port Hope Hospital with a full body cast and a spot on the local newspaper’s front page for the crash. 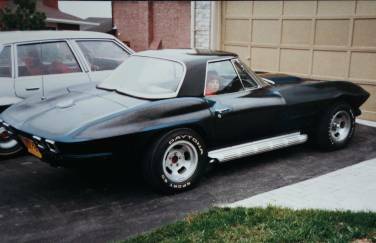 More cars passed through Dave’s hands: a 1956 Ford, ’57 Chevrolet convertible, ’55 Chevrolet, and later, a 1972 Cutlass, 1976 LeMans and 1964 Corvette. 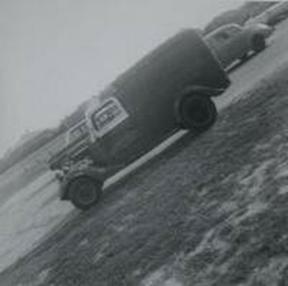 But the most important was a 1935 Ford milk truck that he bought from a farmer’s field in 1966. In order to learn more about building a car, and to have a place in which to do it, he joined the Canadian Motor Club in Toronto on the advice of Frank Agueci. The club lasted until the mid-1970s, when a fire occurred in the centre where it met. When the truck was finished, it was time to put some miles on it, and Dave did exactly that. He drove with a friend throughout the U.S. as far away as Florida and California (“We stayed out on the ocean and went to Van Nuys Blvd and your eyes were running because of the smog, and it was awful but you can say you did it,” he says), and then up to North Bay. At Speedsport it took the first-place trophy in its class. In 1972 he sold it for $2,200, and after working on a couple more, got out of cars for a while. In the meantime, his jobs included working with high-speed labelling machines, aircraft landing gear and microwave radar manufacturing. He also married Gerda, with whom he has three children and now five grandchildren. 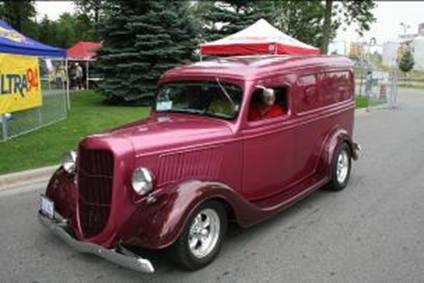 He was preparing to get into the winemaking business – he and Gerda own Glass Act Winemaking – when they went to Speedsport in 1983 and he spotted his 1935 truck, now yellow and black and “not in the best of shape,” he says. “I told Gerda, ‘That’s my truck,’ and she said, ‘How do you know?’ like there is one for sale on every corner.” It indeed was his truck, and Dave had an idea: he would buy it back and use it to advertise his new business. He originally paid $125 for it when it was discarded in a field; this time, he spent $12,000. The price included a new paint job from the current owner, who had a bodyshop. car club. He also knew member Dave Gerard, with whom he’d hung out when they both lived in Toronto. “My probation was so long that I wrote a letter, and they said they’d forgotten me!” he laughs. 1995 Camaro, and put it all back together. Once again, the work was worth it: at its debut at Performance World, it took three trophies, including first in its class. It was just the beginning of a series of events, including long-distance trips that he and Gerda took to various shows, and a stint at the 50th anniversary of the Detroit Autorama where it also came home with some hardware. In 2006 he got together with Frank and with Mike Campbell to hold a reunion of the Canadian Motor Club. A dozen members showed up, many of whom Dave said he hadn’t seen in thirty years. He and Gerda still enjoy travelling, and with his interest in genealogy, he’d like to spend time when he retires searching out the various branches of his family tree and visiting relatives on the west coast. He’s also open to the idea of building another hot rod in the future.